The christians represent 2 % of the indian population ( i.e. the third religious community after the hindus and the muslims). They belong to different churches : catholic, protestant, evangelical and orthodox, each of them being divided in various denominations. 60 % of the christians live in the south, under a line linking Goa to Chennaï ( formerly Madras). By travelling in the south Indian countryside, it’s not rare to see a church tower, looking like an european one, announcing the approach to a village. In the southern state of Kerala, where Saint Thomas arrived in 52 AD to evangelize, the christians ( 20 % of the inhabitants of this state, most of them observing the syriac catholic rite) like to say that their community is as old as the one founded by the apostle Peter in the West. Because of the commercial links between the Middle-East and the Malabar coast ( South-west India), christianism in Kerala has for a long time been linked with the Middle-East Church and the syriac rite. This tradition has lost its vigour after the first missionaries arrived in the end of the XV° century…and particularly the Portuguese ones who considered the local populations as heretics because they were not roman catholics. Catholic missionaries ( in particular Saint Francis Xavier) have converted the local populations before the arrival of protestant Churches in the XVIII° century with proselytes coming from Northern Europe. In 1970, the creation of the Church of South India has included the protestants, the anglicans, the presbyterians, the methodists, the congregationalists. Despite of the Bible teachings, christians still follow the brahminical caste system… with an additional complication : catholics and protestants refuse to marry with each others. While many christians are tribals or untouchables who converted because they were despised or considered as impures by the hindus, their conversion to christianism has not modified their economic and social status. Tribal and low caste christians are still despised and wretch ! 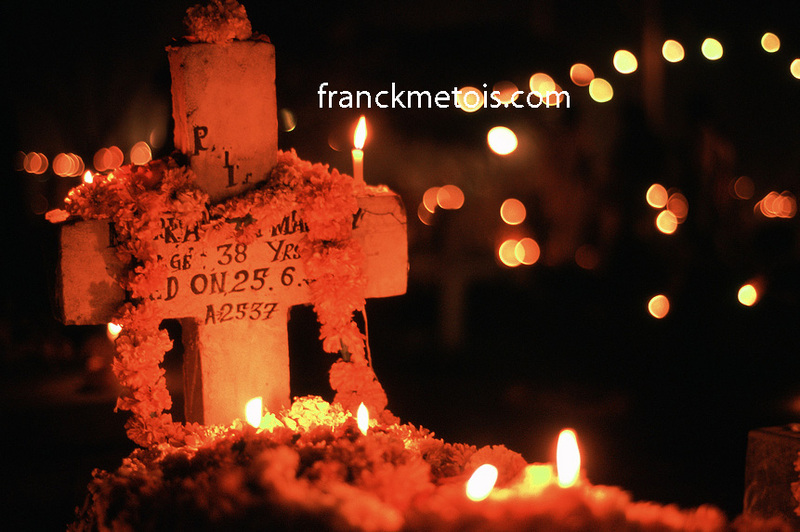 This entry was posted in India, religion, society and tagged all saints' day, candle, catholic, cemetery, christian, commemoration, festival, inde, india, indianization, kerala, mission, photographie, photography, sad, saint francis xavier, saint thomas, south india, syriac, travel, voyage. Bookmark the permalink.